Ideally... and we do mean IDEALLY (in other words, in a special wonderful world where everything is perfect), your dogs and cats should be getting their teeth brushed, by you, very regularly too. Yep, and you should be checking their teeth and their gums often to make sure they are healthy and clean and that nothing untoward is developing in those toothy gobs of theirs. But the truth is that most of us... even the most ardent pet lovers... don't bother much with proper dental care for pets. We pay a lot of attention to the more obvious stuff but often let their teeth take care of themselves. Ever have your vet tell you that your dog or cat needs some serious teeth-cleaning or even extractions? Well, this doesn't come about by accident; despite the various healthy foods and chew toys we make sure our pets get, their teeth do in fact require that not-so-little-bit of additional, direct attention. The trouble is, however, that if they were not exposed at a very young age to the manipulation of their mouths by human hands, they may very well not be too happy with the poking, the prodding and the peering that goes along with your examination. So if you’re lucky enough to have a young kitten or puppy, do try to practice handling their mouth and lips often - opening their mouth, touching their teeth with your fingers, pulling back their lips to see their gums and top of their teeth, and giving it all a good looksee... all on a regular basis; perhaps when you’re both relaxing and exchanging some cuddles. (These "examinations" don't actually have to be unpleasant at all, and certainly not aggressive - it's all about intimacy and trust, and a bit of practice.) If your lil' fella is a bit older, it might take some time and patience for them to get on-board with the idea of regular oral inspections, but do persist because there is a pay-off. In fact, even if you can't bring yourself to do this frequently, then do it INfrequently - even a few times a year is better than never. No matter what their age, once they're at peace with the ANNOYING handling, you can then escalate the intrusion but trying to clean their teeth for them as well. Cover your finger with a bit of gauze (or buy a cat toothbrush that slips over your fingertip or a dog toothbrush) and give them a good ole toothbrushing. With the gauze-wrapped finger technique or pet-appropriate toothbrush, you simply give a slight downward swipe to each tooth. And wouldn’t you know it, there are toothpastes created specifically for cats and for dogs (poultry is reported to be the most favoured flavour among 4 out of 5 pets!) which you can use... or you can use nothing at all (remember, there's the "ideal" and then there's what we can get around to actually doing - and something is always better than nothing, in this case). However, DO NOT under ANY circumstances use human toothpaste (c’mon now, we didn’t need to mention that did we?). So what’s the big deal about taking intentional care of their teeth? Well, aside from preventing bad breath (NOBODY fancies a stinky-stanky mouth breathing hot air in their face), taking the time to brush their teeth helps to reduce the plaque bacteria that can build up on their teeth which may well end up causing gingivitis (inflamed gums), which if not removed can ultimately become calculus that, in turn, may lead to periodontal disease, which is when the bone and tissues of their teeth become infected, become loose and may possibly even fall out. You don’t want that to happen, obviously. Yellow, brown or discoloured teeth. Loose teeth, broken teeth or teeth that sit at weird angles. Swollen face, mouth or jaw. Drooling or discharge from their mouth. Avoidance of playing with their toys. 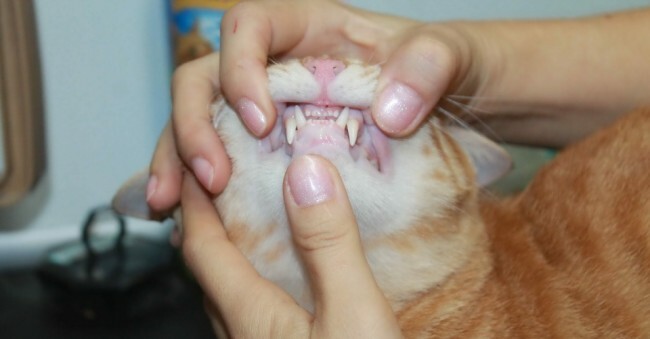 At their annual vet visit and after an oral exam, their vet will provide you with the best oral care plan, which may include: a dental scaling and cleaning; a new diet; or a recommendation for the use of oral rinses, sprays or gels. However, if you notice any of the above symptoms between their annual visits, a trip to their vet to rule out any developing problem is certainly in order. So... now that their dental care is all sorted (yay! ), it’s time to move on to your critter’s annual vaccinations. If you’re on the fence about doing their annual jabs, here’s a bit about why you should definitely vaccinate your pet. Previous topic My Puppy Says "No Way,… Next topic Bored Out of My Bone!